Every once in a while it’s great to surprise your dog with a special homemade treat – especially if it’s simple to make! 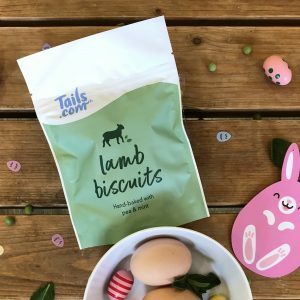 So with Easter coming up, we’ve come up with a festive recipe to complement our new hand-baked lamb biscuits (which are easy to add from your online dashboard). And as an extra treat, it can be served at breakfast or dinner time. Because who doesn’t love eating breakfast for dinner? The main ingredients should be easy to find in your kitchen cupboard – eggs! Eggs aren’t just delicious, they’re filled with nutritious protein and “good fats”. So they’re great for us humans and they’re great for your dog too! Crack an egg into a microwaveable bowl and whisk. Add in a tablespoon or two of water, a handful of peas and stir. 2. Put in the microwave for 30 seconds, stir and back in for another 30 seconds. Tip: You can swap out peas for any of your dog’s favourite veggies. You can make sure they’re dog friendly by checking our blog on which vegetables dogs can eat. 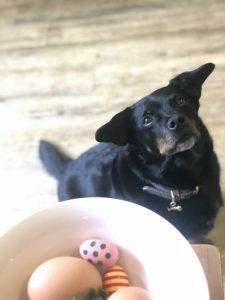 Remember: all treats count, so if you do serve up these pooch-friendly eggs, balance the extra calories out with a longer walk or a bit more play.